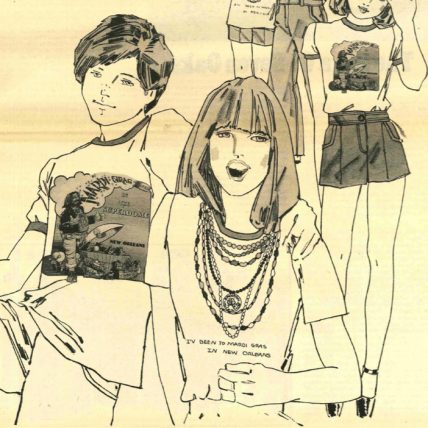 Can you beat the ‘70s in PRC’s dry t-shirt contest? Can you beat the ‘70s in PRC’s “Dry T-shirt Contest”? 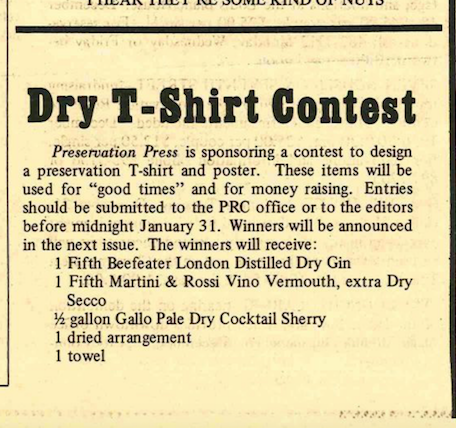 In 1976, the PRC held its first “Dry T-shirt Contest.” This brilliant contest — with the mixings for a dry martini as the prize — generated our favorite PRC T-shirt. But now, we think you can top it. 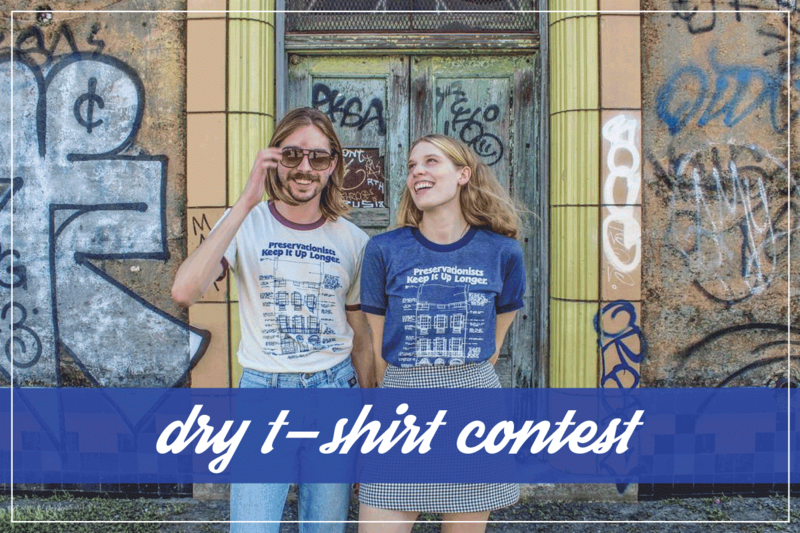 In homage to our 1970s PRC colleagues, we’re re-launching the Dry T-shirt Contest. 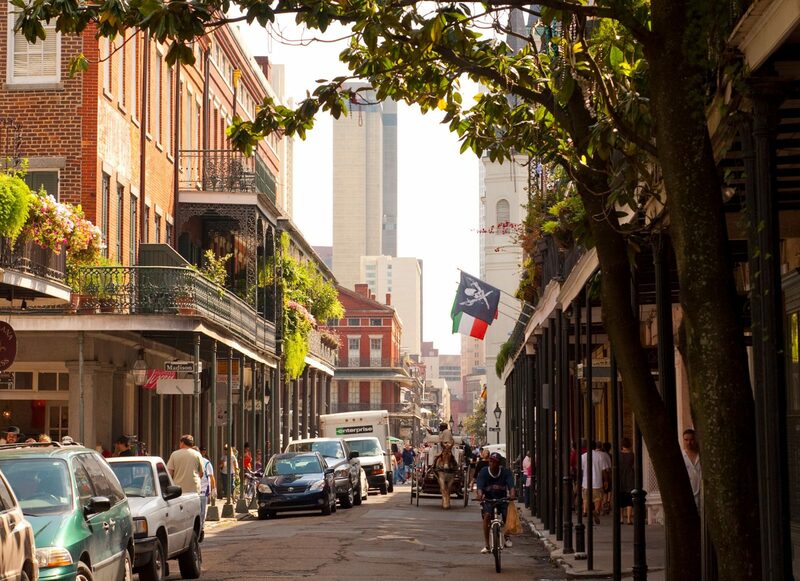 To enter: Send us a slogan or a slogan and artwork on the theme of historic preservation in New Orleans. All entries must be in a pdf or eps format and emailed to susanl@prcno.org. Deadline: April 1. Winner will be announced in the May issue of Preservation in Print. Prize: We’ve decided to keep the dry martini fixings, but added some New Orleans flavor. The winner will receive 1 Fifth of Gentilly Gin; 1 10-ounce bottle of Peychaud’s Bitters; 1 Fifth of Martini & Rossi Vino Vermouth, extra Dry Secco; and a new T-shirt with the winning design.